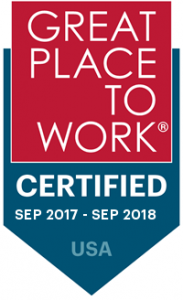 Frisco, Texas — October 18, 2017 — For the second year in a row HRchitect, the leader in Human Capital Management (HCM) technology consulting services, was certified as a great workplace by the independent analysts at Great Place to Work®. HRchitect earned this credential in both 2016 and 2017 based on extensive ratings provided by its employees in anonymous surveys. A summary of these ratings can be found at http://reviews.greatplacetowork.com/hrchitect. Great Place to Work surveys were sent to a random cross-section of HRchitect employees at all of its U.S. and Canadian locations, producing a 90 percent confidence level and a margin of error of ± 5.07. “According to our study, 98 percent of HRchitect employees say it is a great workplace,” says Sarah Lewis-Kulin, Vice President of Great Place to Work Certification & List Production. Among the many other standout ratings, 100% of respondents said they can count on people to cooperate, 100% of respondents said that management trusts people to do a good job without watching over their shoulders, and 100% of respondents agreed that management recognizes honest mistakes as apart of doing business. The second consecutive year of certification at as a Great Place to Work comes at the beginning of what is forecasted to be a strong Q4 for HRchitect, which will be concluding its twentieth year of business in 2017. The company expects to see continued strong growth in 2018. As the leader in HCM Systems strategic consulting, HRchitect offers end-to-end HR technology consulting services focused around strategic planning, evaluation and selection, change management, implementation, project management and ongoing support of HCM systems of all types including Talent Acquisition, Talent Management, Learning Management, Workforce Management, Benefits, HR/Payroll, and more. Over the past two decades, working on over a thousand successful engagements for clients of all sizes and industries across the globe, our experience is vast and unsurpassed. We have expertise around all major HCM systems including Benefitfocus, Ceridian, IBM Kenexa, Oracle, Taleo, SAP, SuccessFactors, Saba, ServiceNow, Ultimate Software, WorkForce Software and more. HRchitect is a name you can trust for all of your organization’s HCM technology-related consulting needs. Learn more about HRchitect online at www.HRchitect.com and on Twitter at @HRchitectNews.